Scientists taking a new look at older data from NASA's longest-operating Mars orbiter have discovered evidence of significant hydration near the Martian equator—a mysterious signature in a region of the Red Planet where planetary scientists figure ice shouldn't exist. Jack Wilson, a post-doctoral researcher at the Johns Hopkins University Applied Physics Laboratory in Laurel, Maryland, led a team that reprocessed data collected from 2002 to 2009 by the neutron spectrometer instrument on NASA's Mars Odyssey spacecraft. 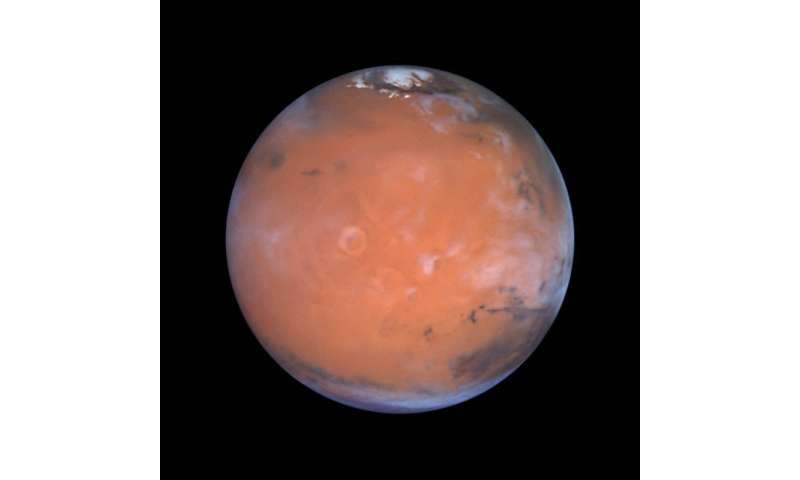 In bringing the lower-resolution compositional data into sharper focus, the scientists spotted unexpectedly high amounts of hydrogen—which at high latitudes is a sign of buried water ice—around sections of the Martian equator. By applying image-reconstruction techniques often used to reduce blurring and remove "noise" from medical or spacecraft imaging data, Wilson's team improved the spatial resolution of the data from around 320 miles to 180 miles (520 kilometers to 290 kilometers). "It was as if we'd cut the spacecraft's orbital altitude in half," Wilson said, "and it gave us a much better view of what's happening on the surface." The neutron spectrometer can't directly detect water, but by measuring neutrons, it can help scientists calculate the abundance of hydrogen—and infer the presence of water or other hydrogen-bearing substances. Mars Odyssey's first major discovery, in 2002, was abundant hydrogen just beneath the surface at high latitudes. In 2008, NASA's Phoenix Mars Lander confirmed that the hydrogen was in the form of water ice. But at lower latitudes on Mars, water ice is not thought to be thermodynamically stable at any depth. 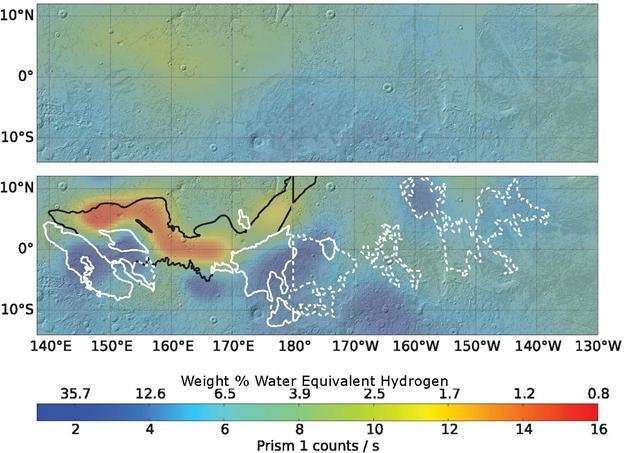 The traces of excess hydrogen that Odyssey's original data showed at lower latitudes were initially explained as hydrated minerals, which other spacecraft and instruments have since observed. Wilson's team concentrated on those equatorial areas, particularly with a 600-mile (1,000-kilometer) stretch of loose, easily erodible material between the northern lowlands and southern highlands along the Medusae Fossae Formation. Radar-sounding scans of the area have suggested the presence of low-density volcanic deposits or water ice below the surface, "but if the detected hydrogen were buried ice within the top meter of the surface, there would be more than would fit into pore space in soil," Wilson said. The radar data came from both the Shallow Radar on NASA's Mars Reconnaissance Orbiter and the Mars Advanced Radar for Subsurface and Ionospheric Sounding on the European Space Agency's Mars Express orbiter and would be consistent with no subsurface water ice near the equator. How water ice could be preserved there is a mystery. A leading theory suggests an ice and dust mixture from the polar areas could be cycled through the atmosphere when Mars' axial tilt was larger than it is today. But those conditions last occurred hundreds of thousands to millions of years ago. Water ice isn't expected to be stable at any depth in that area today, Wilson said, and any ice deposited there should be long gone. Additional protection might come from a cover of dust and a hardened "duricrust" that traps the humidity below the surface, but this is unlikely to prevent ice loss over timescales of the axial tilt cycles. "Perhaps the signature could be explained in terms of extensive deposits of hydrated salts, but how these hydrated salts came to be in the formation is also difficult to explain," Wilson added. "So for now, the signature remains a mystery worthy of further study, and Mars continues to surprise us." Wilson led the research while at Durham University in the U.K. His team - which includes members from NASA Ames Research Center, the Planetary Science Institute and the Research Institute in Astrophysics and Planetology - published its findings this summer in the journal Icarus. 195,960BC Mars was thrown out of orbit by the self-destruction in a war of the 3rd inhabited Planet in our Sol, Mar System. Milona. The Pleiadian Mission by R Winters based on www,theyfly.com explains.. only for the open-minded. A planet just begging to be colonized. "So for now, the signature remains a mystery worthy of further study, and Mars continues to surprise us." I could not agree more, on both counts. Although there are many factors to consider, readily available water ice in an accessible equatorial region would make Medusa Fossae a potential candidate for colonization. Dr. Zubrin suggested if we could find a extant hot springs that would make life a lot easier. While there may not be any left, it seems more likely that somewhere on Mars there might be a reachable subsurface location with liquid water. In other words, there may be a few select locations on Mars where a well is possible. Keep in mind that there are places in Antarctica where this may be true too. For many reasons, we need to know more about these likely buried ice concentrations. Which must be really easy to be without anything between your ears to get in the way of such inconveniences as logic and the weight of empirical evidence. Probably should be stated in the first person, eg., "which we should be begging to colonize". I really don't think anything in the universe, sentient or otherwise, would really be begging for our august presence.